Quite a while ago, I made my 50 Before Fifty list. Since I've made it, I've decided that there are a couple things that I'm going to have to take off the list or move to a "sometime" list. There was ONE thing on the list that I finally did this week! 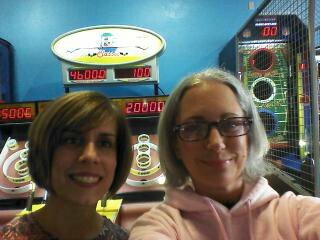 I went to Chuck e Cheese and played $10 worth of Skee Ball without the kids. Haha.. My arm is a little sore today and I figured it would be! $10 = 40 games. On my next to last game. . . . . yep. after already playing over 304 balls, I finally made it over 30,000 points. Never did hit that darn 10,000 hole, though! I've done it before years ago, but I'm sure it was an accident. After everything was over and I took my tickets to the ticket muncher, I had a whopping 132 points. . . . . which I could switch in for 13 tootsie rolls. Too funny! I was going to give the candy to my kids yesterday since I'm trying not to eat sugar, but those darn kids walked in the door yesterday arguing about candy. I'm not even kidding! One of them was accusing the other of stealing her candy. As if they don't have anything better to talk about. Such is life with sugar obsessed pre-teens. I didn't get many photos of my jaunt to the skee ball lanes, but here you go. Proof that I can check another thing off my list. . . . . . 'cause I'm pretty sure I won't be doing a split this year! That might take me the rest of my 3 years left to stretch enough to be able to do that! That and those 20 real pushups! Woo Hoo! More than 30,000 on skee ball! When was the last time you played Skee Ball? Also I need ideas for things to do since I'm going to be taking these OFF the list! I need 3 NEW Ideas! I can't decide if I want to learn how to use a DSLR or not. It seems so complicated, but if the pictures are awesome...it could be worth it.